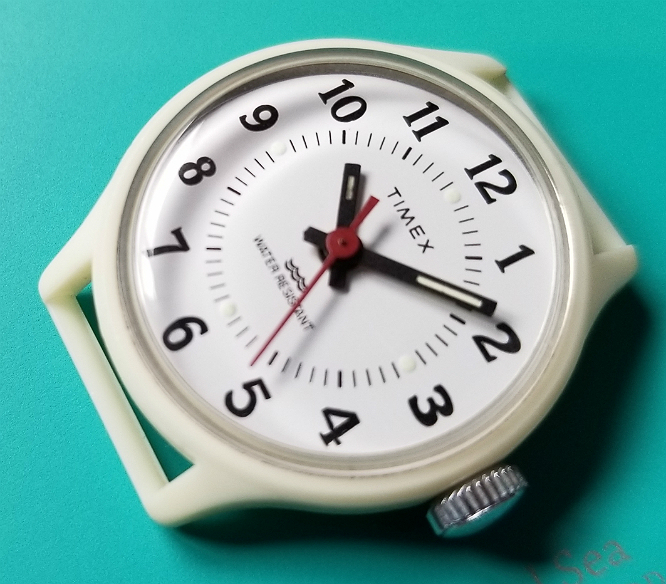 Timex 1980s Mechanical "white Camper" watch. Small! 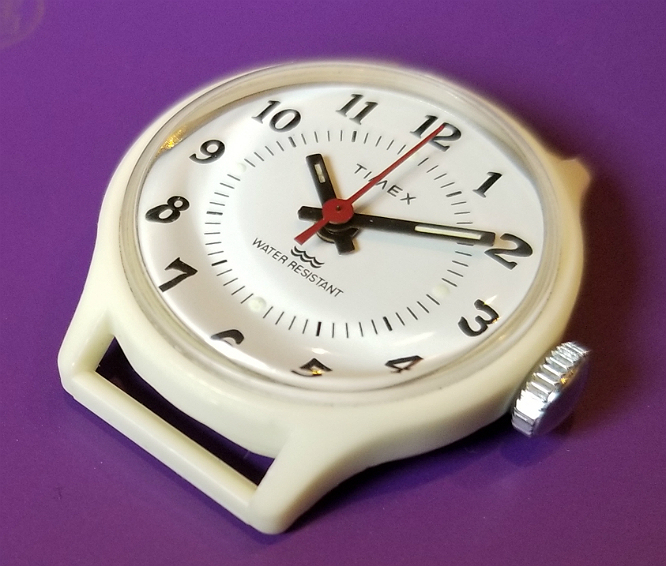 Timex "Camper" - style mechanical watch, in white plastic, early 1980s. Very small! Hi. 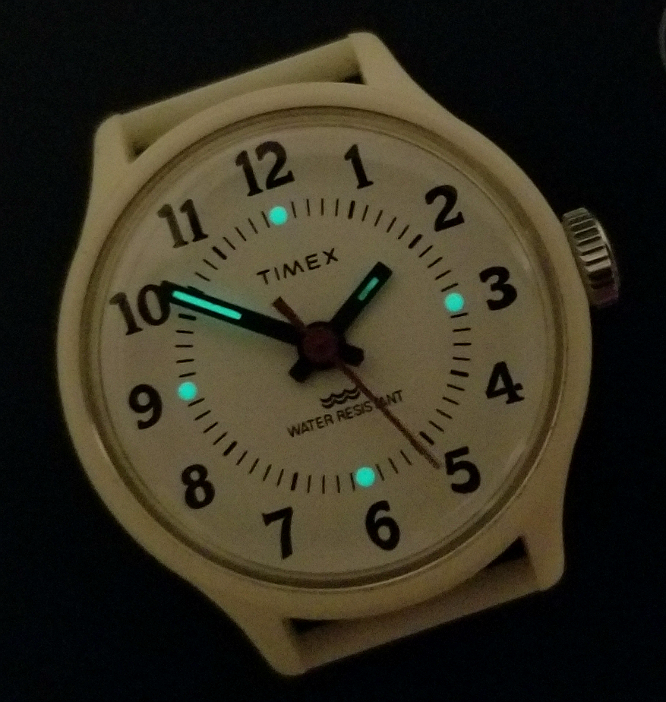 I know virtually nothing about this Timex, and if anyone has any information, I'd appreciate a shout! I'm Alan, and I can be reached at this email. Thanks. 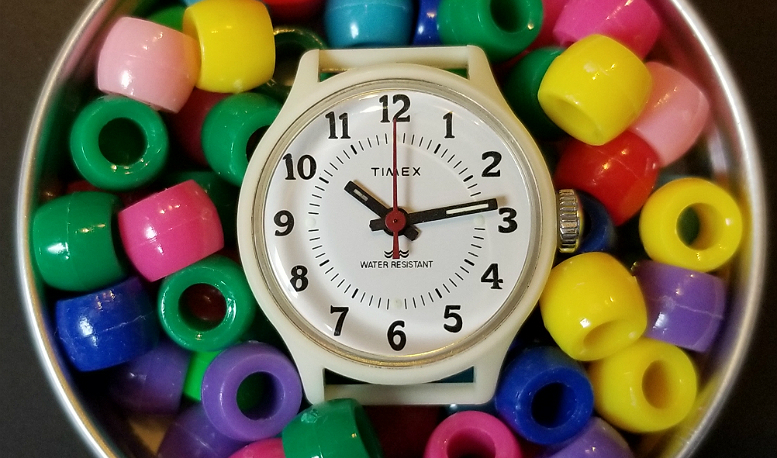 This watch seems to me, over years of looking at Timex watches, to be an unusual Timex. Or maybe unusual in such good condition. Firstly, have a look at the case! It is a scaled down version, appearing quite proportionate, to the cases of the Vietnam war era military specification watches, which went under the general specification MIL-W-46374. This watch certainly would not have been called "Camper," but as I do not know the model name, I will refer to here as White Camper. Or maybe white mini-Camper. BTW, here is my write-up of three mechanical Campers, 1989-1991. The other thing I'm still trying to work out. 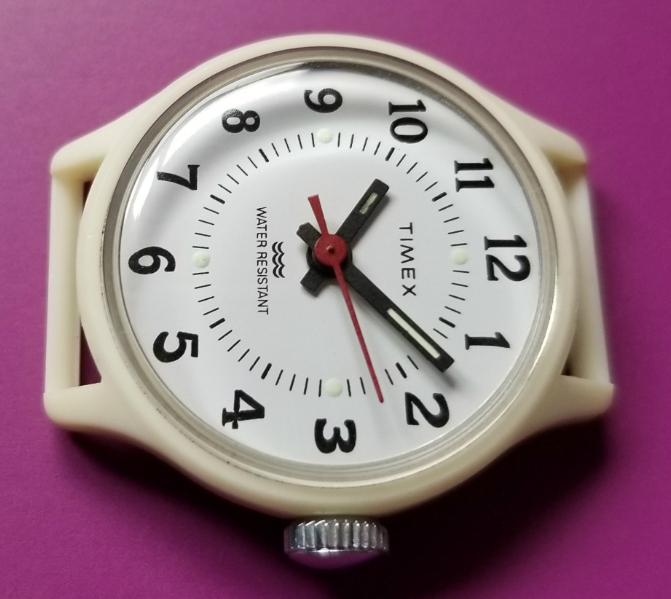 This watch has a mechanical movement (runs very well,) appears to have been made at the tail end of Timex mechanical watch production. I'm not certain, but you'll hear people mention 1982 as the year Timex ceased production of mechanical watches. Maybe it's true. 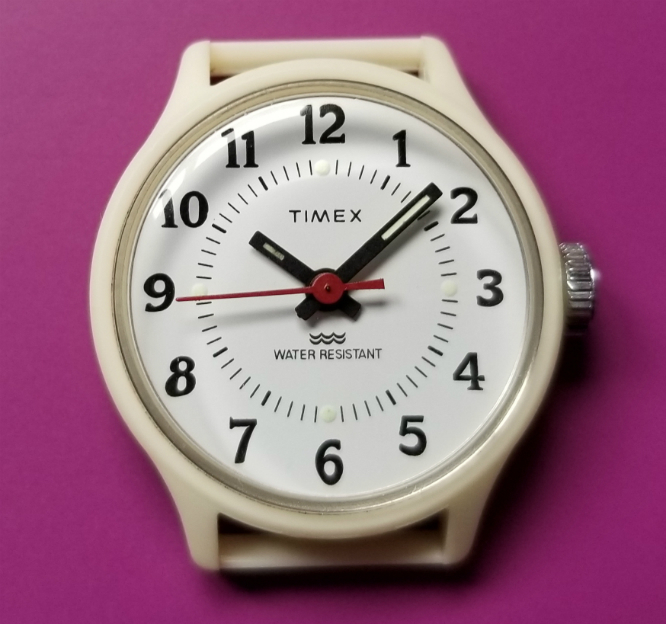 This watch also has, in addition to WATER RESISTANT, which had been printed on dials since the late 1960s, the Timex "wave" symbol. I don't know when this wave symbol first was used to indicate water resistance, but the fact that both are printed on the dial suggests the transitional period before the wave was a stand-alone indicator of water resistance. A combination of these features makes me think this is probably among the last of the mechanical watches that Timex made. If anyone has any insight into this, I'd love to hear from you. [More info: THIS IS WRONG. The quote you'll see of 1982 as the "last year" of Timex mechanical. I never quite believed that, and I've since found examples of mech Timex watches from later years, including into the 1990s, maybe as late as 1994. The watch is in exceedingly good condition. 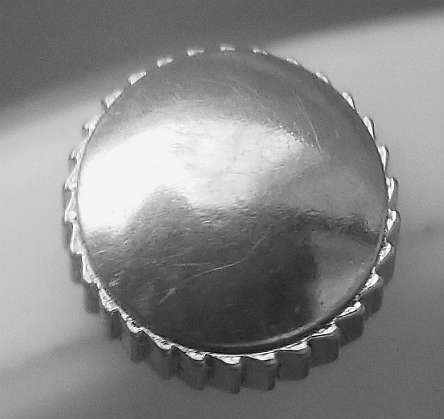 The domed acrylic crystal had only light scratches, which buffed out easily with polishing compound. The plastic case has no detectible gouges or scratches. There was no grime or dirt. The case isn't white but more of a very light cream color. Very pleasing. Dial signed TIMEX as usual. You can see the font for the numbers is some sort of serif typeface. 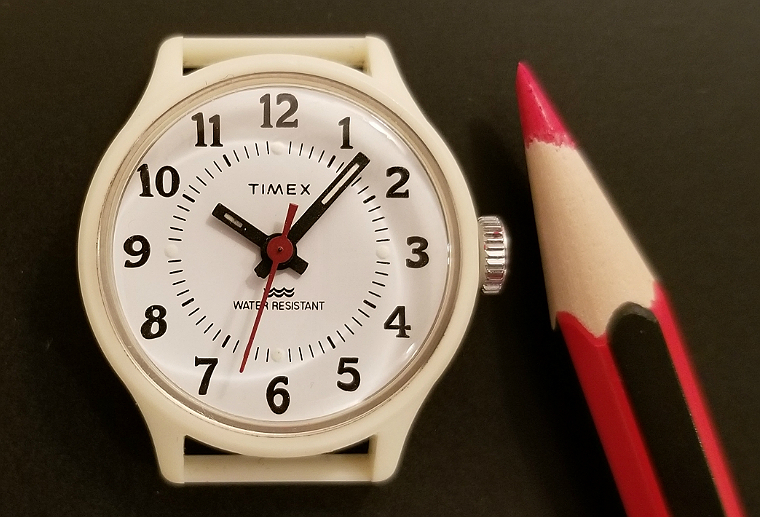 For another comparison, I stacked this little White Camper on top of a 36 mm watch, made by TIMEX Japan, a black plastic case Camper variation from March 2018 that can be seen at this link. 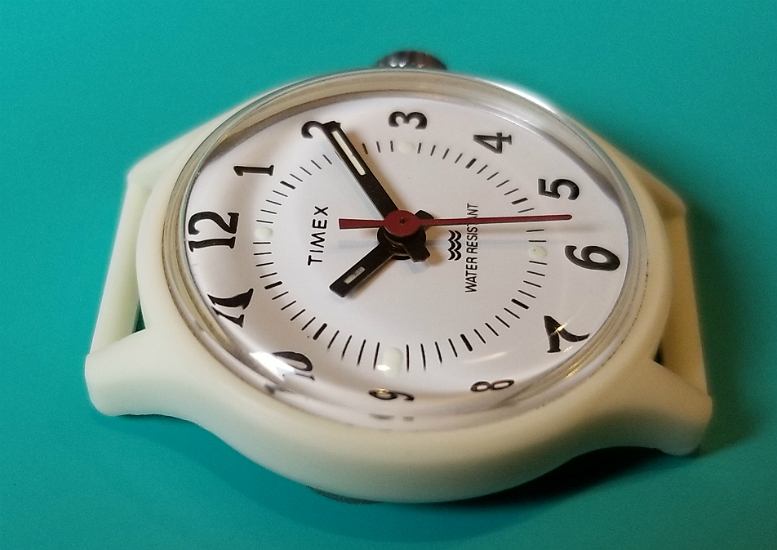 These 36 mm Campers from TIMEX Japan began production in 2015, as a sort of Camper revitalization, a recreation of the 1980s "Original Camper." This 1980s Original Camper itself was based on the original US government specification watch mentioned above. Look how the case of this little White Camper appears to be a pretty faithful scaled-down version of the original! I can't detect significant disproportionality. I really want to know the history of this watch. Crown is nice. I think it's steel, rather than plated chrome like earlier Timex. Notice that the notches on the crown are not simple grooves, or even straight up isosceles triangles, but rather are like "waves" with the edge of the wave pointing opposite the direct of winding, making it an easier grip between your thumb and index finger, reducing slipping. Nice touch. Dial and hands are luminous, with round luminous dots applied to the dial at 12, 3, 6 and 9. The material in the hour hand has faded a bit. The overall look of this watch has a very functional, almost clinical feel to it. Very easy to read. There are sharp contrasts with black and white hands and dial markers. There is a seconds chapter for any needed timing. (I forgot to mention the red seconds hand, I love red seconds hands). 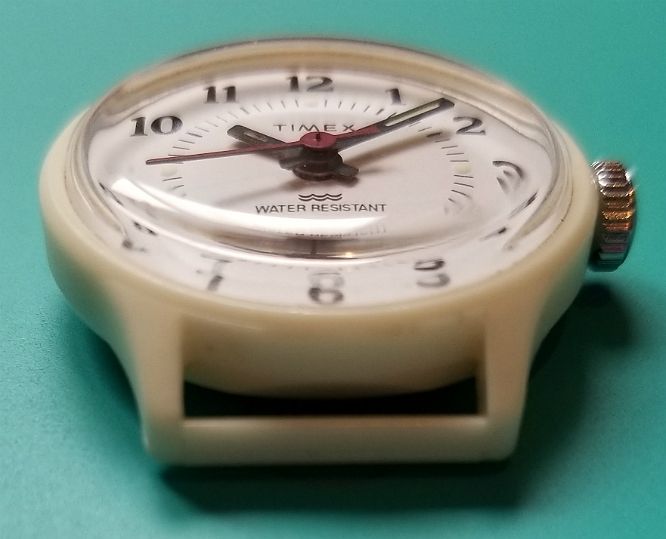 Could this have been a nurse's watch? 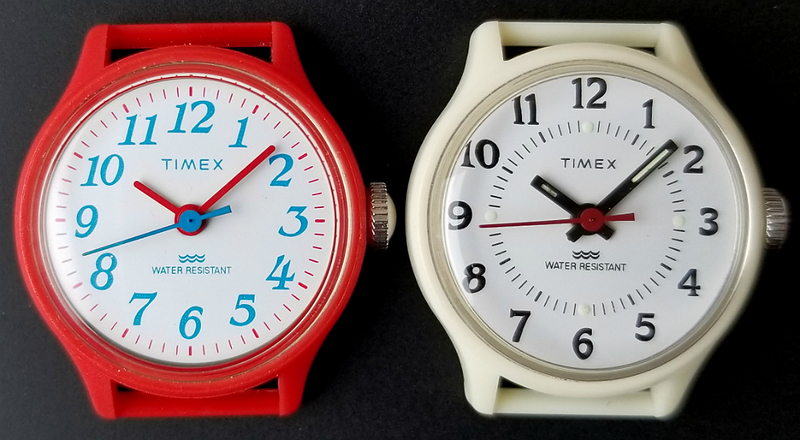 Timex did make them, various styles and designs over the years. Check out the appearance of this nurse's watch from the 1950s. Some similar dial features. As I write this review, more and more, I'm thinking this could have been a watch designed for nurses. Maybe it even was supposed to be a MILITARY NURSE'S WATCH, haha omg. Above and below, good look at the "caseback." 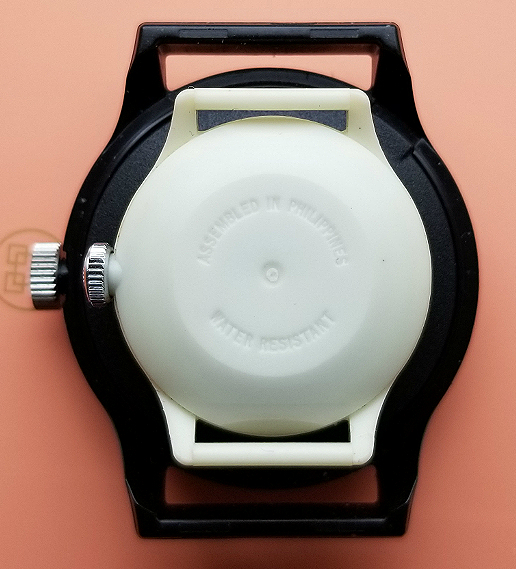 I believe this is a single piece of injection-molded plastic, and therefore I don't think there is a true removable caseback. I can't see a seam or a gap where you'd get a tool to pry anything open. 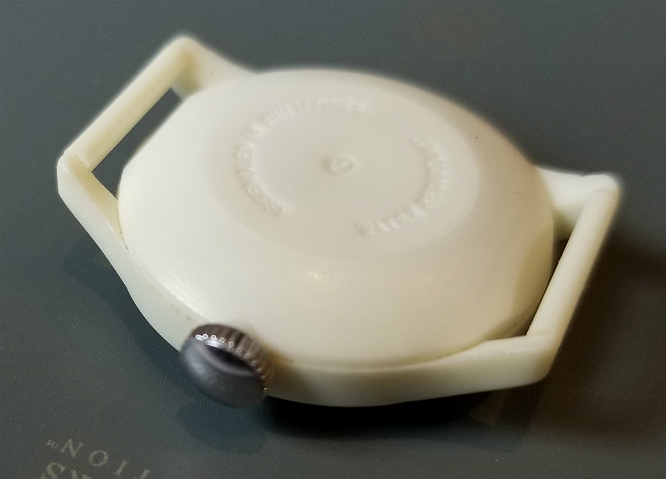 If this is indeed one solid piece of plastic, then this means that if you needed to service the movement, you would have to first remove the crystal, take out the crown/stem, and then the movement would pop out the front. 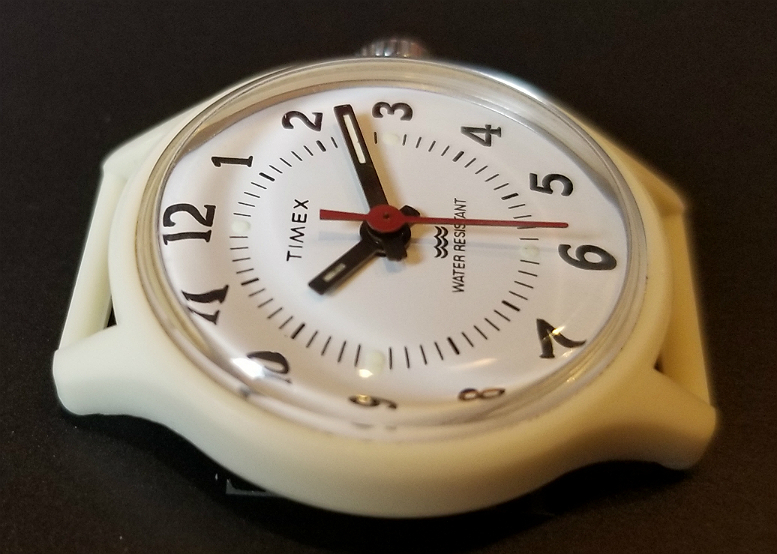 Timex has made other watches like this. 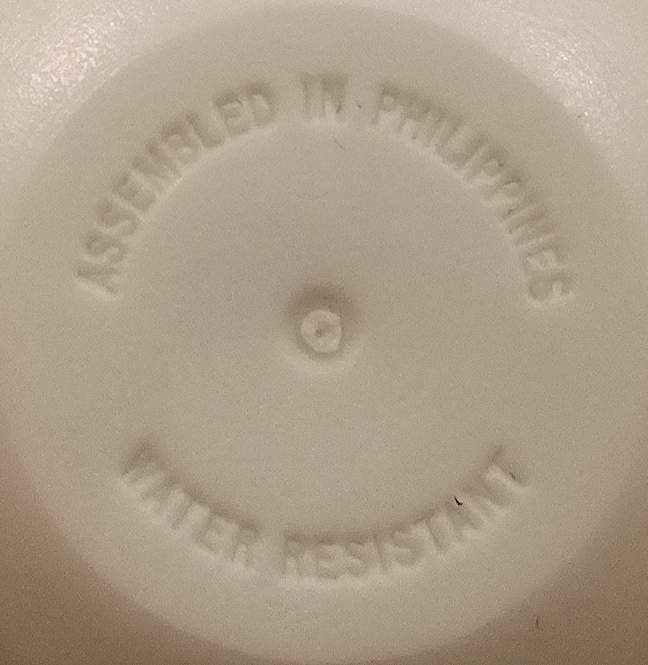 Molded on the back are the words ASSEMBLED IN PHILIPPINES and WATER RESISTANT. The little belly-button in the center is where the hot plastic was injected into the mold. 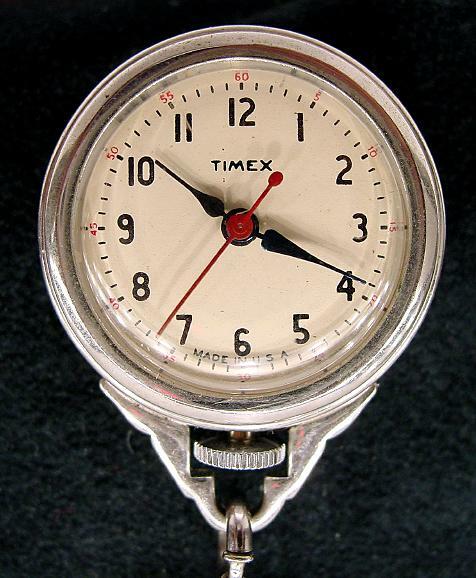 This is a very cute Timex, in really great condition, mechanical movement running well, keeping time. The dial is clear, of high contrast, and has to me a clinical or at least a "highly purposeful occupational" feel to it. I may be totally wrong about that *. 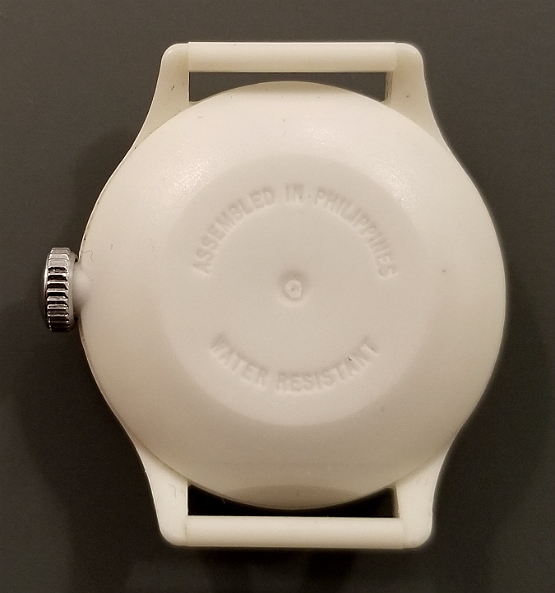 I love that it is housed in a proportionate, scaled down version of the Timex Camper case, in a nice off-white color. What do you think? Feel free to let me know your thoughts, when this was made, etc. As always, thank you for reading these reviews. I can be reached by email, Thanks, Alan. ​Alan's Vintage Watches, Featured Watches. Here is this White Camper, side-by-side with its sibling or cousin the Red Camper. A review to the Red Camper can be found, at this link. 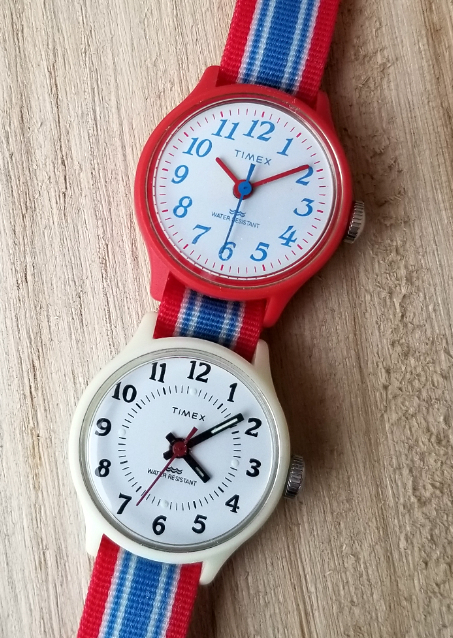 It's clear from the ad in the link, the red one was markted as a kids watch. I'm still uncertain about this white one. "Kids watch," or small watch for adults. Below, I was having some silly fun, and strapped both together in tandem along the strap for Red Camper, to make a pseudo WORLD TIMER GMT TIMEX, with the lower watch set at London/GMT time, and the upper watch at GMT-6 hours. I can be reached by email,Thanks, Alan. Alan's Vintage Watches.